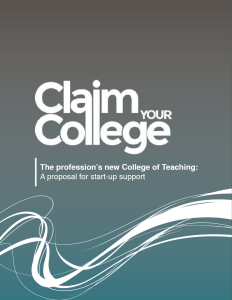 UPDATE: The proposals for a new College of Teaching have been published (2nd Feb 2015) by the Claim Your College coalition. Find out more here. This is a special blog site to publish teachers’ reactions to the Towards a Royal College of Teaching book published on Tuesday 30th April 2013. 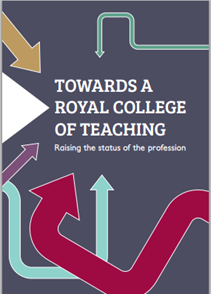 This is a report exploring the various potential roles of a royal college, with essays from a wide range of contributors including teaching unions, subject associations and the existing College of Teachers. It is a collaborative project that will channel responses and feedback into the long-term work of the Independent Commission, facilitated by the Prince’s Teaching Institute. The Teacher Development Trust is collecting responses to this book. This is an informal process which is independent of, but in collaboration with, the formal consultation around a new member-led College of Teaching which will take place later this year. Lizzie Overton (@enliven_ed): Who’s leading the way? Sue Cowley on Miss Smith (@HeyMissSmith) – Oooh Shiny!